MARYLAND SHOOTINGS SHOWN: 1) NOT TO BE RANDOM; 2) OCCURRING ON A SATANIC HOLIDAY DEVOTED TO THE DESTRUCTION OF THE OLD ORDER; 3) SHOOTING PATTERN FORMS A BROKEN CROSS! Title: ORIGINAL MARYLAND SHOOTINGS SHOWN TO BE: 1). 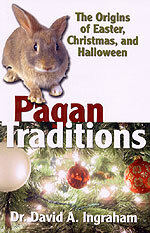 NOT GEOGRAPHICALLY RANDOM; 2) OCCURRING ON A SATANIC HOLIDAY DEVOTED TO THE DESTRUCTION OF THE OLD ORDER. 3) SHOOTING PATTERN FORMS A BROKEN CROSS! Updated October 9, 2002! Subtitle: Updated Information: Satanic "calling card" left at the scene of one of the shootings. Shooter left a "Death Tarot Card" at the scene inscribed with "I am God" message. This Tarot Card proves our original premise that this shooting spree was satanic in nature, a premise we arrived at by the Satanic symbol the shooting pattern left on the ground after the first six shots. Now that 9 shots have been recorded, we may have a satanic symbol within a symbol. A study of the Maryland shootings reveals a pattern that tells a story the Illuminati has been planning for years: the destruction of the Old World Order so the New can be brought in, and the destruction of Christianity, an action taken during a celebration of one of the major Black Virgin Goddesses. Updated NEWS BRIEF: "Sniper Left Taunting Note, Police Say 'I Am God' Scrawled On Tarot Card At School Site", By Christian Davenport and Jamie Stockwell, Washington Post Staff Writers, Fox News Online, October 6, 2002. "The sniper linked to nine area shootings left what appeared to be a taunting message for authorities outside the Bowie school where a 13-year-old boy was shot Monday morning, police sources confirmed last night. 'Dear policeman, I am God,' the message said. Police said it was found on a Tarot card known as the Death card, part of a deck used in fortunetelling. Sources close to the investigation said it was spotted in a wooded area about 150 yards from the school entrance, where police also found a spent shell casing and a matted area of grass that suggested that the gunman had lain in wait." All of us know that the number '13' is Satan's number, standing for the extreme rebellion he represents. In Seminar 2, "America Determines The Flow Of History", we demonstrate all the many uses of the number '13' in official government symbols, especially hidden in the two symbols of the back side of our One Dollar Bill! Satan and his followers revel in the number '13'. Interestingly, our occult Founding Fathers assigned the number '13' to the fledgling United States of America, choosing to establish their new nation -- the New Atlantis -- once 13 states had been formed. The United States will forever be linked to this nefarious number, one more symbol demonstrating the fact that the occult seeds of our destruction were planted in 1776, and are just now coming to full fruition. Just as Charles Manson planted the "Hanged Man" Tarot Card -- the #12 card -- at the Sharon Tate murders, so this shooter(s) has left a Tarot calling card. This demonstrates fully that this event is a planned event with Satanists at its core. Now, you know why the first six shots left a Broken Cross symbol on the ground! At this point, Dr. Burns gives us another tidbit of information about the basis of the Tarot Card system that, upon examination, provides really dynamite insight! 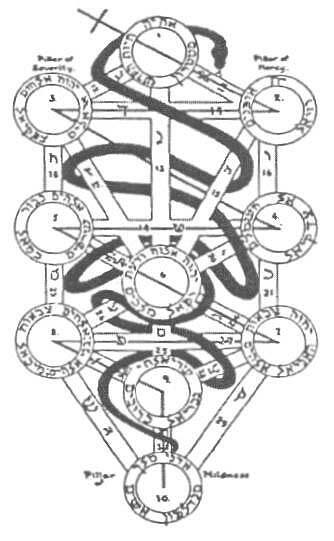 On page 254 of Hidden Secrets of the Eastern Star, Dr. Burns states that the Sephiroth Tree of Life form the "inner foundations upon which Astrology, Tarot, Alchemy, Numerology, Mythology, and Ceremonial Magic are based." The Tarot Card is based upon the Tree of Life symbol, shown here above? To get the significance of this revelation, let us find out more of the Tree of Life. In other words, the Tree of Life is a critically important part of the powerful "High Magic" of the Cabala that produces spells "designed to induce an unseen population of spirits to carry out the magician's wishes." This information is very powerful, coming at a time when the Illuminati is bending all its power to the creation of the New World Order, the Kingdom of Antichrist. We have stated, in our original article, which appears below, that a Satanist places great emphasis on creating Satanic symbols, and loves to place them on the ground. The original six shots of this occult shooting formed the Broken Cross on the ground, with a Tarot's Death Card left at the scene of the middle school shooting. However, since we now know that the Tarot System is based upon the Sephiroth Tree of Life, we immediately think of the Tree of Life symbol located on the ground just a few miles south of the shooting, in Washington, D.C.! In NEWS1399, we revealed that all of Government Mall is shaped like a Sephiroth Tree of Life! Further, in NEWS1040, we broke the story that the street layout connecting the White House with the Capitol was originally laid out by Masonic architect, L'Enfant in 1792, so that the streets formed the evil Goats Head of Mendes Pentagram encompassing the White House -- plus the Masonic Compass, Square, and Rule from the White House to the Capitol. These street layouts continue to this day. The Goats Head of Mendes Pentagram encompassing the White House troubled us the most, since it is a 5-pointed star; occultists believe the number 5 is the number for Death . As we stated in NEWS1399, the occultist believes that symbols reverberate with inherent power from the moment they are created, power that is made even more effective since only the Adepts of Satanic societies and covens know the truth. Furthermore, most spells are not started until the witch or wizard creates a Satanic symbol on the floor or the ground to use during the ceremony; symbols created on the ground are deemed most powerful. Now, we have a symbol on the ground formed by these Maryland shootings; these shootings are now tied into the Tarot, a system of occult belief based on the Tree of Life, a symbol on the ground just a few miles south, in Washington, D.C.
NEWS BRIEF: "Five Killed in Maryland County", Fox News, October 3, 2002. "SILVER SPRING, Md.  Five people were slain within a few miles, gunned down one by one over 16 hours in public places in Washington's suburbs, authorities said Thursday. They said there was a 'strong possibility' the killings were related ... Investigators had not found any indication that the five victims, killed between 6 p.m. Wednesday and 10 a.m. Thursday, were related in any way or had any conflict with anyone, Montgomery County Police Chief Charles Moose said. Still, given the timing and location, 'there's a strong possibility that they are all connected,' police spokeswoman Joyce Utter said." Remember this statement by police spokeswoman, Joyce Utter: "given the timing and location, 'there's a strong possibility that they are all connected,' " This police department statement is going to have a major impact on the facts in this article. Let us now examine the timeline of these "connected" attacks. NEWS BRIEF: "Timeline of Maryland Shootings", Fox News, October 4, 2002. -- 6:04 p.m. Wednesday: James D. Martin, 55, of Silver Spring killed in grocery store parking lot in Wheaton. -- 8:12 a.m. Thursday: Taxi driver Prenkumar Walekar, 54, of Olney killed as he pumped gas at station in Aspen Hill area. -- 8:37 a.m. Thursday: Sarah Ramos, 34, of Silver Spring killed outside post office in Silver Spring. -- 9:58 a.m. Thursday: Lori Ann Lewis-Rivera, 25, of Silver Spring slain as she vacuumed her van at a gas station in Kensington. There were six shootings in all, with the first fatality occurring at the 6pm -- 1800 hours -- time period. The first shot occurred on Wednesday, October 2, as did the first fatality. Then, the last four shootings occurred the next day, Thursday, October 3. 1. October 2-10 is a Satanic Holiday period devoted to the Black Virgin Goddess of Hinduism, Durga Puja, also known as 'Kali'. In the mind of the Illuminati, Kali is very important because she is a goddess of destruction of the old order so the new order can be established. Her primary function is destruction. 2. The first shooting attack occurred at 5:20 pm on the first day of this time period, October 2. However, the first fatality occurred just minutes after the 6pm hour, which is really 1800 Hours according to the International and Military Clock. The Satanist will disguise a reference to '666' through the use of '18', simply because 6+6+6 = 18. 3. The attack occurred in such a manner that the lines thus drawn represent a broken cross! Let us now re-examine these three points so you can see that this shooting event was undoubtedly contrived in order to deliver a very strong message. This revelation establishes the truth that, in Hindu mythology, the Goddess Kali, is a "Warrior Queen", the "only one who could restore harmony and set the world at peace". Her major weapons are the ax and the sword, with which she will knock the existing paradigm down so a new one could be restored. Isn't this exactly what the Illuminati plans to do? Of course, it is. As Galland states, Kali is black, and she is called the "Queen of the Universe", the same term applied to the Virgin Mary of Roman Catholicism. This direct tie-in is the reason Europe has a number of black Virgin Madonnas; they are really Kali. We have studied that the drive to the New World Order was officially started on May 1, 1776, as Jesuit priest, Adam Weishaupt, founded the Masters of the Illuminati. Listen to Galland continue. "...St. Ignatius gave his sword to the Black Madonna of Montserrat in Spain, became a priest, and founded the Jesuit Order..." (p.52). This unbelievable information ties the worship of the Black Madonna to the Jesuit-based Masters of the Illuminati. Both the worship of the Black Madonna and the Jesuit Order are completely Roman Catholic, and steeped in the occult. And Kali is the ultimate, most powerful Black Madonna! "The Goddess Kali, is the fierce and all-compassionate black Mother who is blacker than any evil and therefore absorbs all evil. She destroys ego with her sharp knife which slices through the world's illusions. Kali removes the pain of her children, becoming darker and uglier in the process with all that she removes from them. In her total desire to rid her children of ego, Mother Kali is wild, wearing 52 skulls around her neck, representing the Sanskrit alphabet. She wears hands around her waist which have been cut off so that they will commit no karmic action against humanity. Kali is said to have been created from the third of eye of Mother Durga while she was battling the demons Canda and Munda. Her consort is the great Lord Shiva who is often shown lying prostrate at Kali's feet - completely still to counteract her constant movement." Can Kali be the goddess in the occult realm that symbolizes this Second Seal of Revelation 6? Since Adam Weishaupt directly tied his Masters of the Illuminati into the Black Virgin Madonna -- Kali -- in Europe, I think this symbolism tie-in may be valid. Thus, on the first two days of this annual Satanic celebration of Kali, the goddess of destruction and death, we have the shootings in Maryland. 2. The first shot was fired at 5:20pm on the first day of the Satanic celebration period, but the first fatality occurred at four minutes past the 1800 hour point. As we stated earlier, the number '18' is sacred to the Satanist because it is formed by adding three '6's together. In fact, the number '18' is used many times to hide the more obvious and very much more offensive, '666'. a. The exact spot of each shot, including the first shot that just hit a "Prayer of Jabez" book and caused no fatalities. Shot 2 -- Occurred 6:04pm on 10/2, at Shopper's Mart, killing James D. Martin. This point is marked "2" on the right hand arm of this symbol. Please note that the shootings stopped temporarily, to be resumed the next morning. At this point, the shooters were out of position for the third shot. Shot 3 -- Occurred 7:41am on 10/3, at White Flint, killing James L. "Sonny" Buchanan, Jr. as he was mowing a lawn! 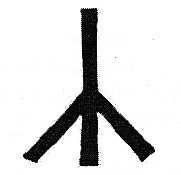 This location is marked "3", and is on the left hand arm of this symbol. Note that the shooters traveled some distance between Shots #2 and #3. Shot 4 -- Occurred 8:12am on 10/3, as cabdriver Premkumar A. Walekar, is shot at a Mobil gas station. 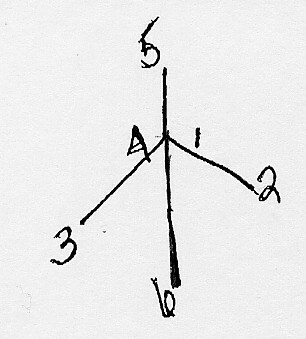 This location is marked "4" on this symbol, and forms the nexus point of this symbol; however, since Shot #5 was yet to come, this symbol was just two straight lines joined by Shot #4. Shot 5 -- Occurred 8:37am, on 10/3, in Silver Spring, killing Sarah Ramos while she was sitting on a bench in front of a post office. 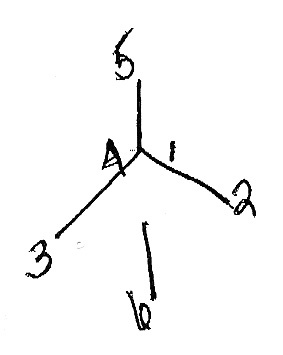 This location is marked as "5" on the symbol and forms a topmost point. Shot 6 -- Occurred at 9:58am, on 10/3, in Kensington, killing Lori Lewis Rivera, as she was vacuuming out her minivan. This location is marked as "6" on the symbol and forms a bottom-most point of the symbol. Once you take a straight edge to connect the dots, you get the symbol shown at left. At first glance, it looks like a modern swept-wing aircraft. However, since we know that this shooting occurred on the first two days of the Satanic Holy Days for the Goddess Kali -- the destroyer Goddess who wears a necklace of 52 skulls from her victim and wields a huge sword -- we may expect that the symbol formed by these shootings might be occult as well. 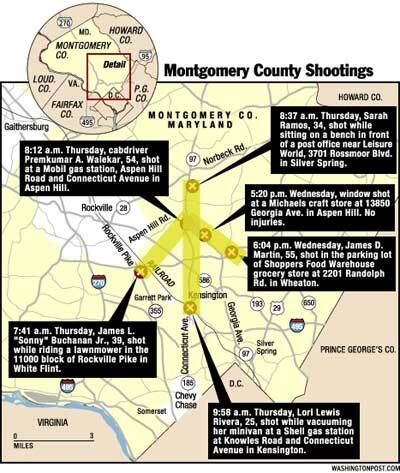 As you can see by examining the Broken Cross created by connecting the shooting locations on the Montgomery County Shootings Map, shown on the left, a Broken Cross truly is created! How occult is this Broken Cross? Indeed, the picture formed is very Satanic! Occultists called it "Nero's Broken Cross", or the "Sign of the Broken Jew", "Witch's Foot", or a symbol of the coming Antichrist! [Dr. Cathy Burns, "Masonic And Occult Symbols Illustrated", p. 235]. Let us allow Dr. Burns to give us more detail. Don't you find it highly interesting that this symbol, formed on the ground, by these 6 shootings, is a symbol of paganism's twin hatred of the Jew first and the Christian secondly? Emperor Nero originated this symbol to demonstrate his belief that he could break the Christian movement with his iron fist, with his unbelievable planned martyrdom's of Christian believers. Nero took the standard cross and simply "broke" each arm, forcing each arm downward at an angle. But, Satan was not finished with the Nero symbol; he ensured that the pagan Hindu religion also utilized this symbol in a very important manner: by chanting the "Aum", the Hindu believer awakened the "serpent power of Brahma" within his body! This is demon possession of the highest order. By establishing America's Capitol as a new Babylon, attendant with so many Satanic symbols on the streets and the buildings, our Founding Fathers believed the entire Government Center would throb and reverberate with occult power 24 hours a day, seven days a week, gradually moving this country into the New World Order, the Kingdom of Antichrist. Therefore, a symbol is of supreme importance to the Satanist. Symbols drawn on the ground are very, very powerful. This fact is the reason a witch will draw the required symbols on the ground prior to the beginning of any particular ritual ceremony. A Broken Cross symbol has now forever been established on the ground in Maryland Country, Maryland. It is the symbol of Antichrist, and the murderous actions that were carried out, were accomplished on October 2-3, the beginning days of the Satanic worship of Kali, the Goddess of destruction of the old system so the new can be established! During the Clinton Administration, Americans endured a rash of school shootings that just seemed to tear at our national fabric. We simply could not fathom how on earth school kids could take guns to systematically slay their teammates. However, we got a break in our understanding when a former Satanist -- now Born Again and a Cutting Edge subscriber -- found a most revealing map of the United States as he perused a website he used to frequent before he was gloriously saved. An occultist was boldly bragging that there was a master occult plan behind the school shootings, and he claimed that this map proved it. We issued our report on NEWS1344 and encourage you to read it in depth now. On this map of the United States, we saw two intersecting lines at a very precise angle we originally thought was a Pentagram, but which we later proved was a Hexagram; these intersecting were drawn on a map of the United States, intersecting at Hope, Arkansas, an intersection made bold by a big blue dot. Along each of these two lines, three school shootings had occurred; however, they did not occur geographically according to time. Only after two years, and six school shootings had occurred, did this pattern become completed. The chance that these six Maryland shootings occurred by accident in such way as to create a symbol on the ground as this Broken Cross are astronomically against it. Gun Control is the #1 Domestic Priority of the Illuminati. No dictatorship in history has ever tolerated private gun ownership, and every time a dictator took a while to establish his dictatorship, he systematically took guns away from his people. For example, prior to establishing his absolute dictatorship in 1939, Adolf Hitler announced a gun confiscation preceded by the most lofty rhetoric possible, in which he declared that he was making Germany safer for all its citizens. In reality, Hitler was simply ensuring that no group of private citizens could rise up against him. Once the guns were confiscated, Hitler clamped his dictatorship on the country and began to take the action that began World War II. The Washington Post map of the initial shootings demonstrate conclusively they were planned ahead of time in order to produce a Satanic Broken Cross. This fact is so evident, we should expect an official propaganda disinformation campaign designed to confuse and obfuscate the truth. Already, we are hearing conflicting reports. In the October 6 Daily News Update, we see two such conflicting reports. The first report says that officials may never be able to connect all the shootings, while the second report states that the shooters were tied into Washington, D.C. shootings. Cover-up and confusion has always proven the best methods of concealing the truth from a gullible citizenry. * Since the objective was to create a pattern on the ground that formed the Broken Cross, the shooters were not concerned with whom they shot, for they were simply going by a map, looking to create fatalities on the right geographical spot. * Thus, the victims were not related by any common thread; they were just standing at the right spot on the map. All the shooters needed was a victim -- any victim -- at the right spot on the map. * Since the shooters were "skilled" riflemen, and working for the Illuminati, they have not been apprehended. If past history is any reliable guide, these shooters may never be apprehended, unless the Illuminati provides us with scapegoats to take the fall. * That the ultimate plan is to destroy Christianity. This has always been a cherished goal of the Illuminati, all the way back to 1776, as the pyramid symbol on the back of your One Dollar Bill demonstrates. [Seminar Two, "America Determines The Flow of History"]. * That the plan is continuing under the Bush Administration. Truly, the End of the Age seems most close. Are you spiritually ready? Is your family? Are you adequately protecting your loved ones? This is the reason for this ministry, to enable you to first understand the peril facing you, and then help you develop strategies to warn and protect your loved ones. Once you have been thoroughly trained, you can also use your knowledge as a means to open the door of discussion with an unsaved person. I have been able to use it many times, and have seen people come to Jesus Christ as a result. These perilous times are also a time when we can reach many souls for Jesus Christ, making an eternal difference.